NCDOT selected Stewart to deliver their first bicycle and pedestrian feasibility project. The Department determined that many of their bike/ped projects would benefit from early design investigations and worked with Stewart to develop pilot project to test the concept. The goal of the project was to quickly evaluate the overall project, develop a recommended alignment, accurate construction estimates, property acquisition strategy, permitting strategy and stakeholder/public consensus. The project corridor included three miles along the Neuse River from the Woodman Center to the African American Music Trail. Challenges included regular flood inundation, poor soils due to unregulated fill, conflicts with sewer and overhead transmission lines, railroad encroachment and coordination with local development activities. The project also posed personal safety concerns due to crime in the area. Stewart worked closely with a stakeholder group totaling over 30 representatives from the City to develop a range of alternatives and build consensus around a final option. Construction estimating was a crucial part of the alternative development process to help decision makers understand the high cost of alignments with pedestrian bridges and boardwalks. The project also includes North Carolina’s first two-way protected bike lane. This “cycletrack,” will utilize part of Atlantic Avenue, and will allow a two-way path for cyclists on the one-way street. 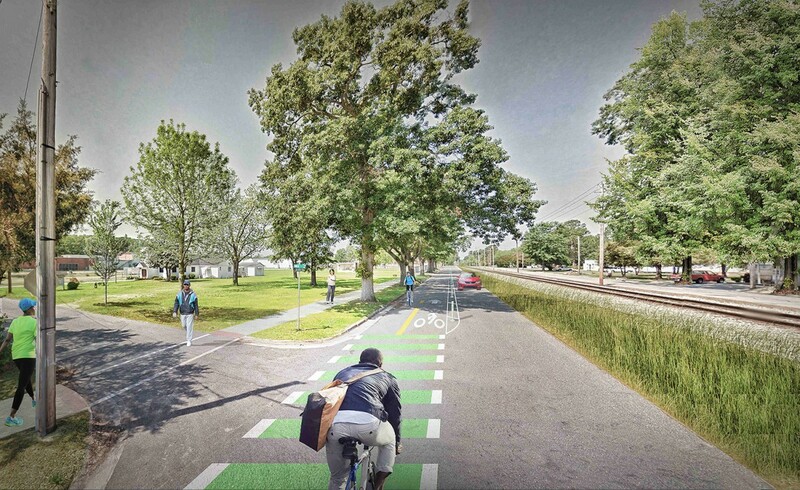 This cycle track will connect two vital pieces of the greenway that would otherwise require costly land acquisition. Stewart applied NACTO Urban Bikeway Design standards, coordinated with NCDOT and gained FHWA approval for the use of green paint.